Pro rugby is coming to Utah. Will there be an audience for it? League and team officials are curious themselves. Rick Egan | The Salt Lake Tribune Professional rugby has historically been a tough sell in the U.S., but a new league that includes a Utah franchise — the Warriors — is going to give it another try. 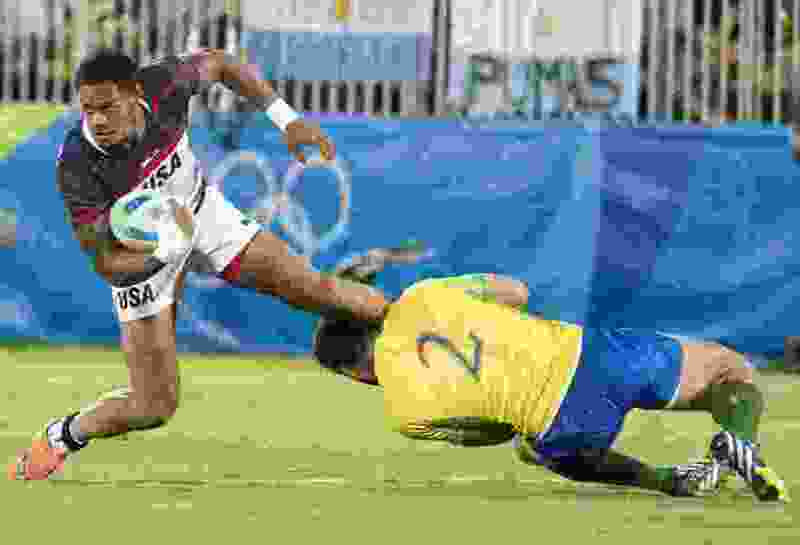 Here, Martin Schaefer (2) of Brazil grabs Maka Unufe (8) of the United States, as he runs for the USA, in Mens Rugby Sevens action, USA vs Brazil, at Deodoro Stadium, in Rio de Janeiro, Tuesday, August 9, 2016. Rugby is a game of constant and continuous motion. As a professional sport in America, however, it has been anything but that with roughly a half dozen failed attempts over the past two decades. Can the Salt Lake-based startup, Major League Rugby, which kicks off its inaugural season later this month, be the one to buck the trend? Following Major League Soccer’s single-entity model, and thanks to multi-year broadcast deals with CBS Sports and ESPN, MLR officials believe they have found a winning game plan for turning what has been viewed as a niche sport into a commercially viable pro league. On Thursday afternoon at Rio Tinto Stadium, the league introduced itself and one of its seven teams, the Utah Warriors, at a press conference. The Warriors will play their first game at the soccer stadium on March 30 but will play the majority of their contests at the smaller Zions Bank Stadium in Herriman. By Jaquet’s own count, there have been at least a half dozen pro rugby leagues that have tried and failed to get off the ground in the U.S. over the past 20 years. Last year, a league called PRO Rugby folded after eight months. So you would be forgiven for viewing Major League Rugby with a skeptical eye. Looking out at the 20,000-plus seats at Rio Tinto, Warriors center Paul Lasike even wondered what kind of crowd his new team might draw. Lasike grew up playing rugby in New Zealand and later transitioned into a football standout at BYU. He spent two years in the NFL with the Arizona Cardinals and the Chicago Bears, but all the while he stayed in touch with one of his old rugby coaches back in Provo. Kimball Kjar, who coached Lasike at BYU and recruited him to Major League Rugby, is now the general manager of the Utah Warriors. Kjar has spent the last two years working with other league officials to prepare a plan to give the league as long a runway as possible. This week, the league announced a digital partnership that includes an 18-game package with ESPN. The league previously had secured a three-year deal with CBS Sports Network. This year, the network will broadcast 13 league games on Saturday nights. Next year, CBS Sports will carry 20 league games, including a championship game on its main network. “We can weather the first 3-5 years, which is probably what it’s going to take to make this work,” he said. Kjar, for one, is betting on success.